Everyone comes to the fountain pen hobby for different reasons. Some come for the community. Others for the handwriting. Some are drawn to the pens, others the ink. 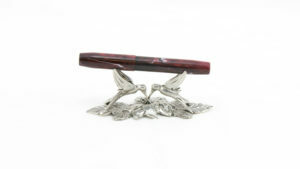 Some become fascinated by the array of vintage pens available, and feel the draw of the hunt to find the perfect specimen for completing their collection. Some are drawn in by the artistic nature of putting pen to paper. All of these reasons are valid, of course, and most of us are here for several of them. 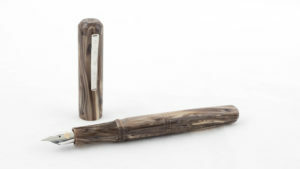 But for many new to the hobby, it is first and foremost about finding a pen that writes well. That’s certainly how I decided to get my first fountain pen. And most new entrants to this hobby aren’t willing to spend hundreds or thousands of dollars right out of the gate for a single pen. In fact, many will never get to that point. 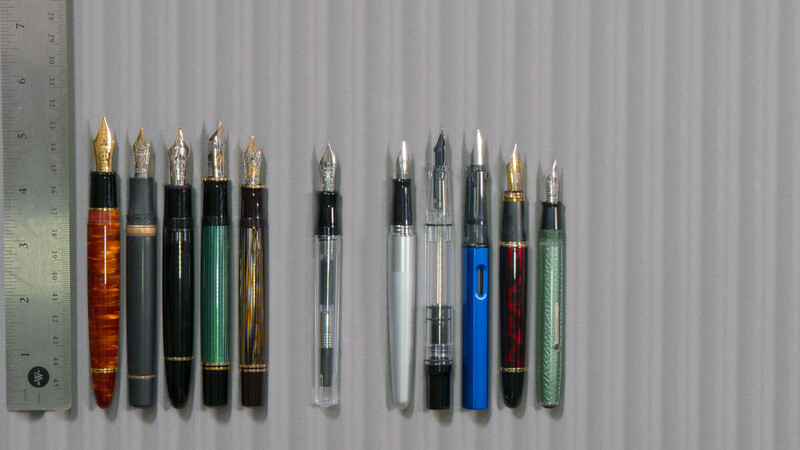 For those who want to dip their toes into the colorful waters of fountain pens and inks, there are a few very standard suggestions for a first pen: The Lamy Safari, the Pilot Metropolitan, and the TWSBI Eco. 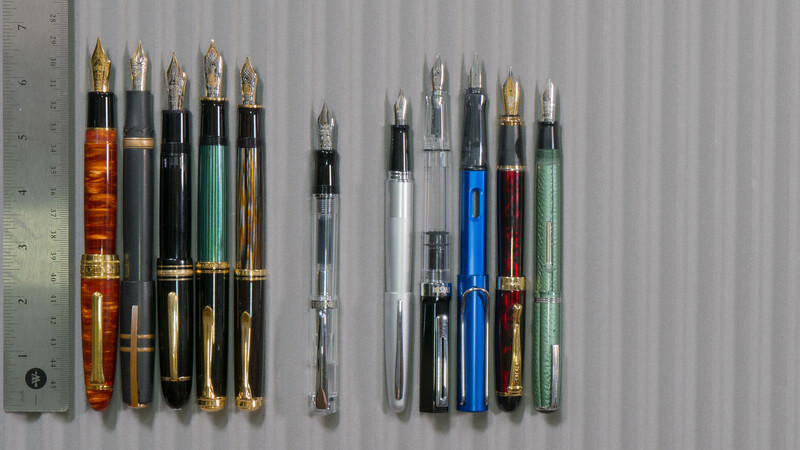 These are all good pens, but they are certainly not the be-all-end-all of the entry level market. There is also the panoply of inexpensive Chinese and Indian pens that can be very good or, due to poor quality control, very, very bad. 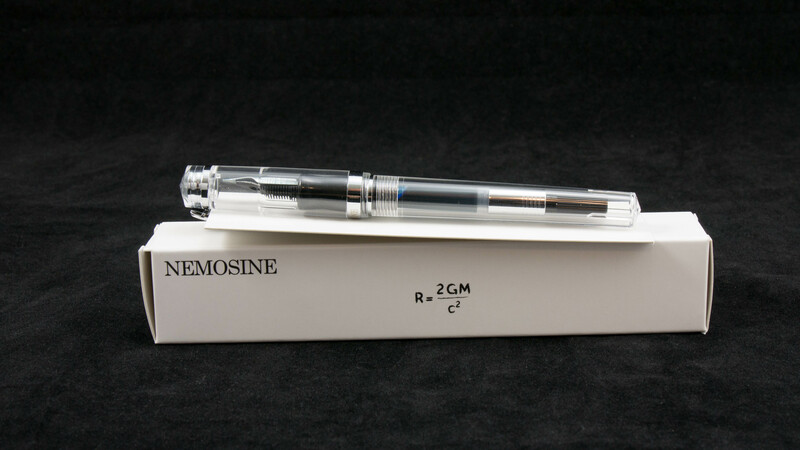 One US company that has been quite exploring this affordable starter pen market is the Pennsylvania-based firm of Nemosine. In an earlier review, I decided on a pronunciation of [neh-MAH-suh-nee, after the Greek titaness Mnemosyne. Subsequently, I have learned that the company pronounces it [NEH-moh-sine]. 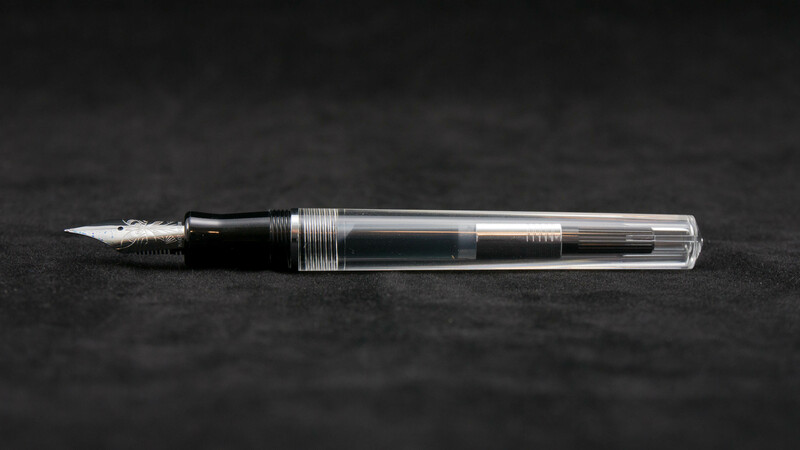 The entry level Nemosine model is the Singularity—an acrylic pen with a #6 steel nib and a very affordable $20(ish) price point. 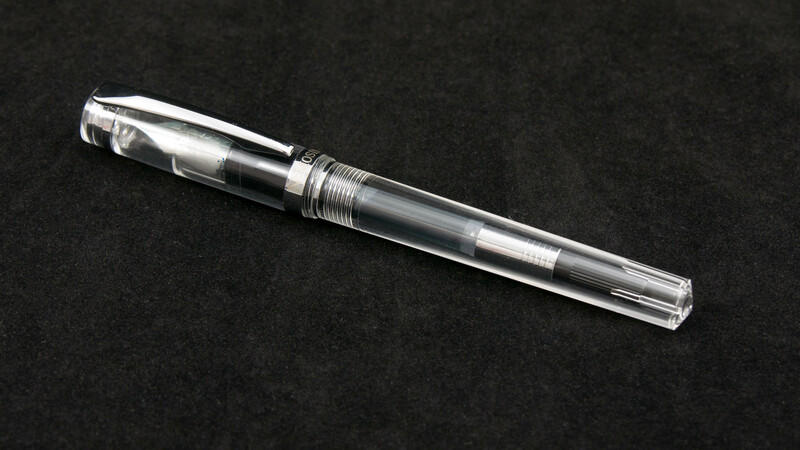 The Singularity that was sent to me for review was the clear acrylic demonstrator model. The pen appears to be injection molded. The cap is topped by a clear finial in a flattened cone shape. The springy clip is held on via a chrome ring below the finial and has a clean, faceted design. 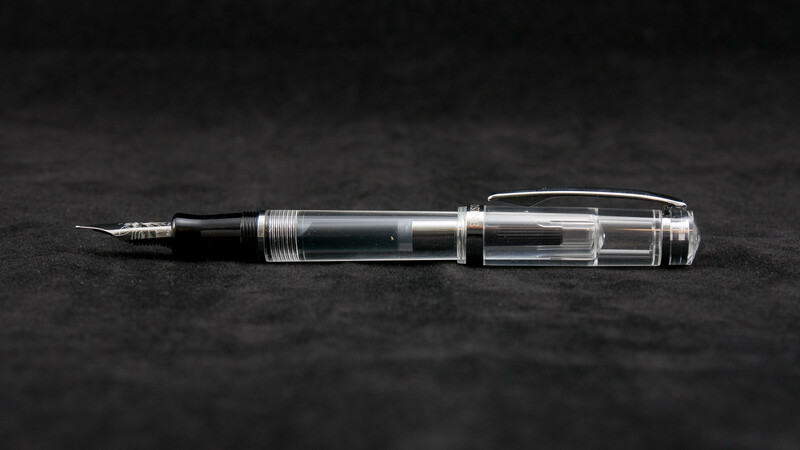 The walls of the cap are crystal clear and show an internal step-down and a couple of clear, molded supports through which the pen’s nib and section are quite clearly visible. 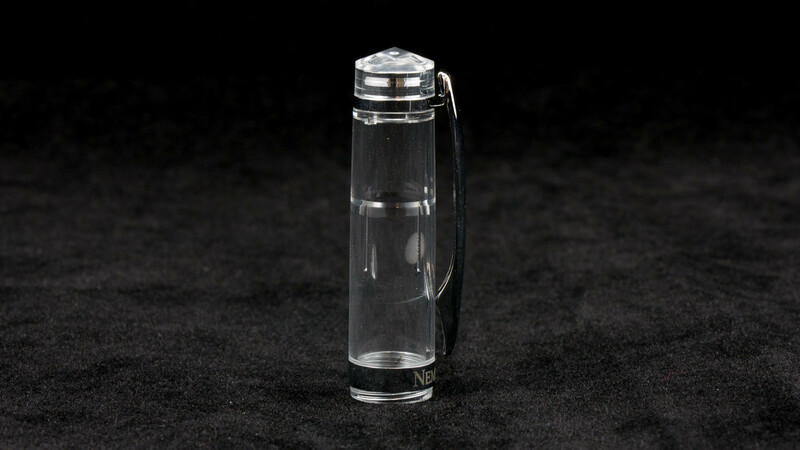 The cap is, um, capped off with a medium chrome band onto which is engraved “NEMOSINE” in a clean, serifed titling font. The barrel would be rather unremarkable were it not for the astonishing clarity of the material. 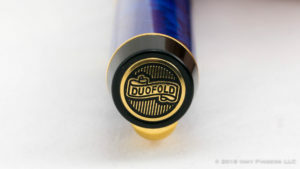 The only real visual features of the pen are the internal supports at the end of the barrel, and the rounded cone at the end of the pen with an injection molding hole. Most injection molds are 2-piece molds which can leave behind a line where the two sides of the mold come together. Some manufacturers, especially those of inexpensive goods, choose not to properly polish out that join line; in the case of the Singularity, either the manufacturer did a killer job of polishing the pen or they discovered a way to use a 1-part mold, as there are no visible seams on any of the injection-molded pieces. From top to bottom, the acrylic is crystal clear. The pen’s cap comes off on very smooth, quad-start threads and takes 1 1/4 turns to uncap. These threads are, in my opinion, the only major design flaw with this pen. 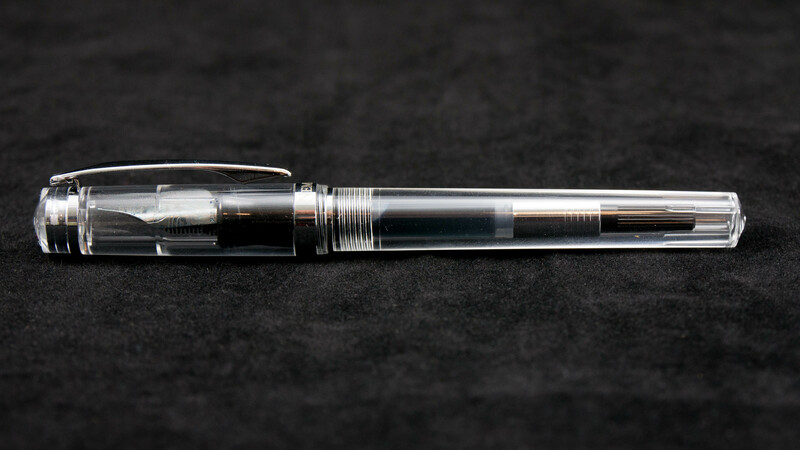 On most pens, the threads on the cap mesh with threads on the barrel of the pen. This allows the friction point between the cap and barrel to be the sole interaction when uncapping a pen. On the Singularity, they have molded the threads for the cap into the section instead. The threads on the barrel also mesh with the section. As a result, there are two points of friction in the uncapping action: the barrel to the section and the cap to the section. Depending on which point has the least friction to overcome, it’s possible that the action of removing unscrewing the cap could remove the cap, or it could remove the barrel, leaving the section and converter firmly attached to the cap instead. This scenario has not happened to me, but there have been some complaints about the issue online, and I could see this being a potential problem if you got grit or dried ink in the cap/section threads making them “stickier” than the threads between the section and the barrel. The pen uses standard international cartridges and converters, in either short or long format. Unlike most European pens in this price point, the Singularity actually comes with a very high-quality converter. The tenon and barrel threads are both plastic, and the barrel is airtight, so this pen could also, in theory, be used as an eyedropper. However, in light of the thread designs described in the paragraph above, I would be very careful in doing so: you could accidentally unscrew the barrel and have a right mess on your hands. 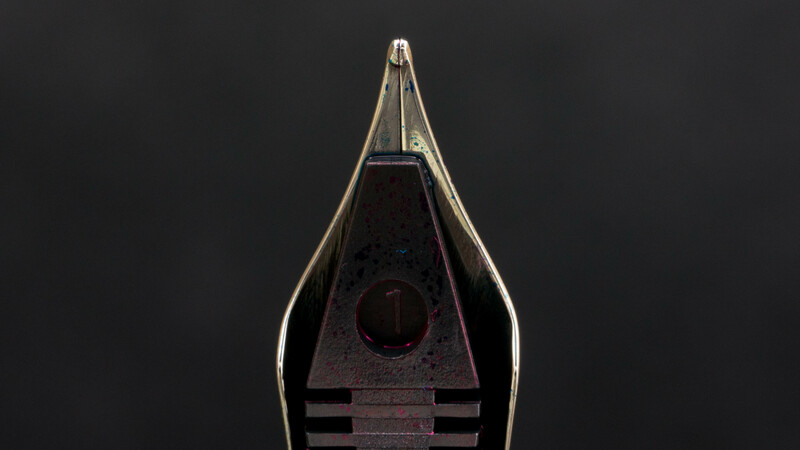 The Singularity’s nib is a standard-sized #6 steel nib. 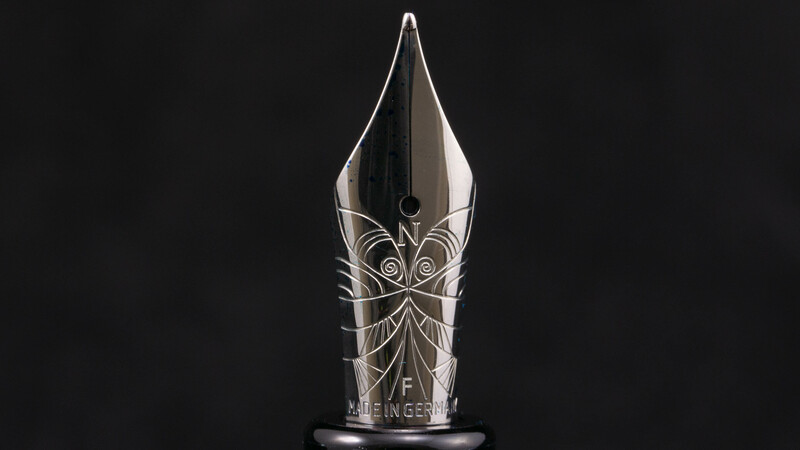 There is a beautiful, geometric butterfly design on the nib face, along with the block letter “N,” the designation (F), and the words “Made in Germany.” The fine nib gauge designation seems accurate for a western nib, although this is one of the finer western nibs I’ve had the opportunity to use. The ink flow is consistent, but on the dry side for my tastes. 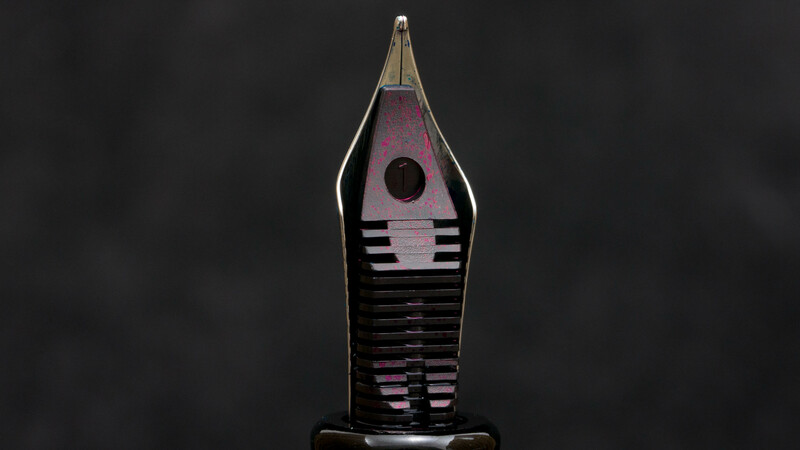 The nib tip itself is well-polished, with some pleasant feedback, while still having a very smooth feel on the paper. There were zero hard starts or skips in longer writing sessions. This pen would be a good writer for those who may not have access to good paper or who don’t want a super-juicy nib. In the hand, this is one of the most comfortable pens I have used in the sub-$50 price range. 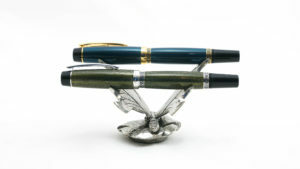 The pen is lightweight and nicely balanced, either posted or unposed. The section is a nice, concave shape, and even though the threads do fall under my grip, they aren’t sharp or particularly uncomfortable. The larger #6 nib helps me keep a comfortable grip while still being far enough away from the paper that I don’t have to adjust my preferred 45° angle of writing. 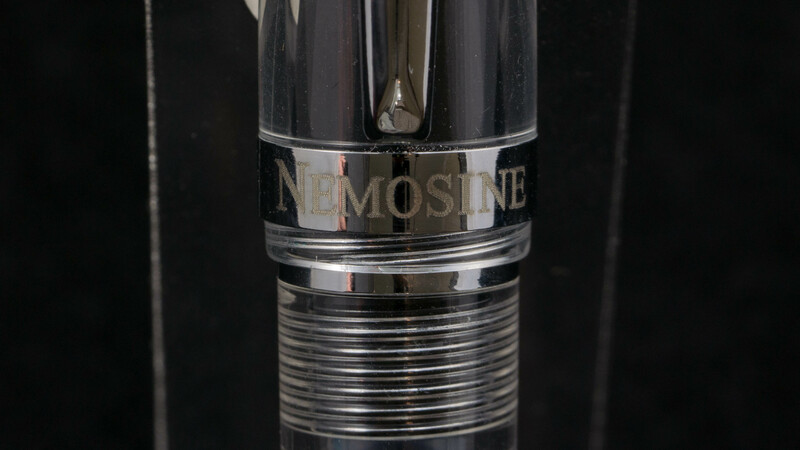 The is the third Nemosine I’ve had the opportunity to use and the second one I have reviewed. For a company that makes and sells such affordable pens, two things stand out to me. First, Nemosine nibs come in some of the standard nib gauges (XF, F, M, B) but they also have a couple of very unusual sizes for stock nibs: a .6mm and a .8mm stub (for those who want a stub nib but find a 1.1mm or 1.5mm nib too broad.) Secondly, the nibs on Nemosine pens are consistently quite good. Despite the low cost of the Singularity, they appear to spend time on some pretty good quality control. Even with the thread design issue, the Nemosine Singularity is a great pen for the price point. In fact, I far prefer it to the two most recommended starter pens, the Lamy Safari and the Pilot Metropolitan. 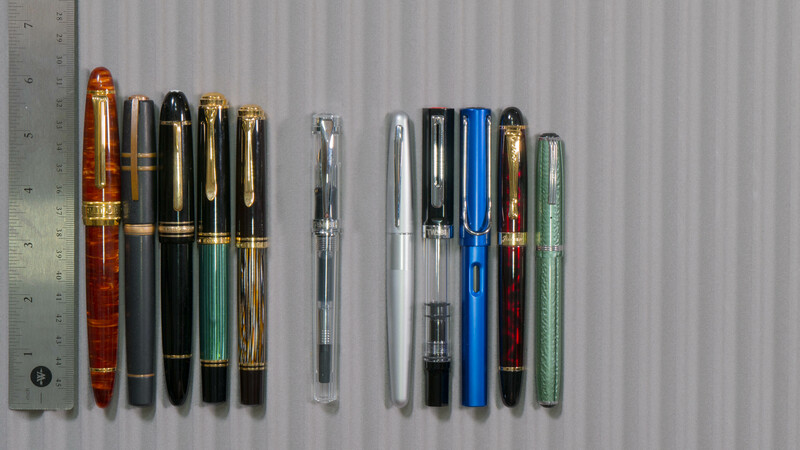 And now that Nemosine pens have gone into full distribution through other retailers, I expect to see them become more and more popular for first-time pen buyers. The Singularity doesn’t quite knock the Faber-Castell Loom out of the top spot for pens I recommend in the sub-$50 price point, but it has certainly taken a place among the top five. 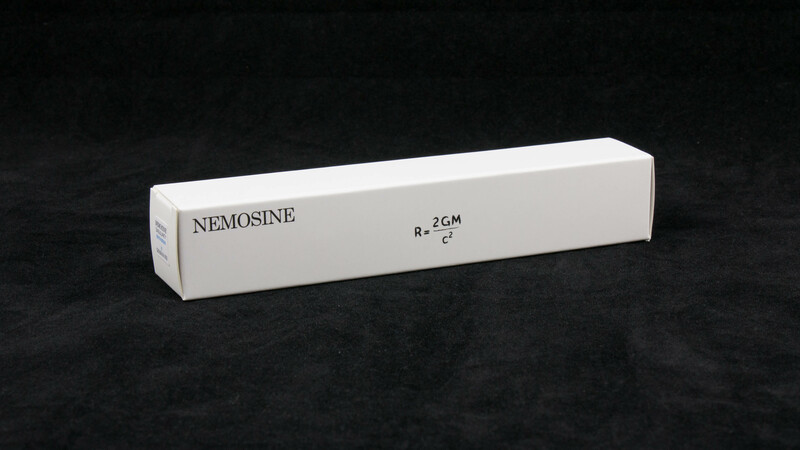 The pen for this review was provided free of charge by Nemosine, and will be given away during Season 4. No additional compensation was provided. All opinions expressed herein are my own.